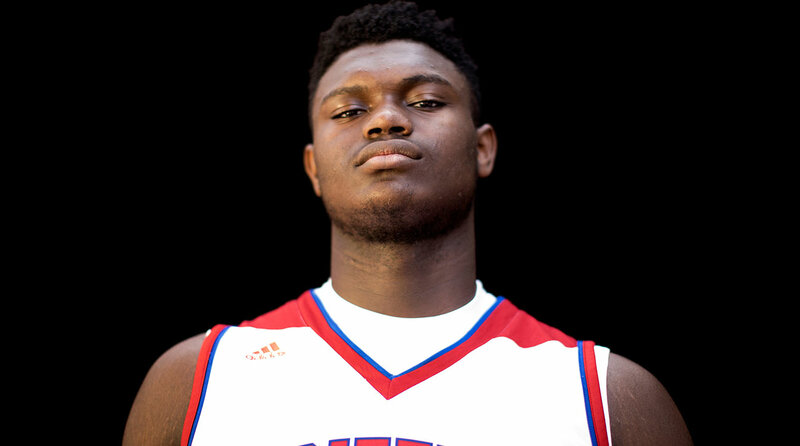 How did Zion Williamson and other future NBA prospects do at the HoopHall Classic? Will one-and-done become two-and-none? The Crossover's Front Office examines in Draft Dispatch. SPRINGFIELD, Mass. — They all showed up for Zion Williamson, and so Williamson showed up for them, strolling onto the court at Springfield College with a strut in his step and an expression too fixed to be natural. Everyone's cameraphones are out, at least among males aged 18 and under, many of whom chant Williamson’s name behind the Spartanburg Day School bench. Williamson, five-star prospect and dunker du jour, is here at the HoopHall Classic, live on ESPN and one week away from his college commitment. Murmurs suggest he will pick Clemson, less than an hour’s drive from the high school gym where he will announce his choice. Tonight, he’s here for a matchup that for lack of a better expression, has no Balls. “Chino Hills is about to get killed,” says a teenager peering over press row as Williamson continues warming up. LaMelo Ball was supposed to be here, in a rematch of an already-fabled AAU game that nearly shut down Las Vegas (and the internet) last summer. Of course, he’s not even in the country, but for the thirsty pubescent hordes, Williamson in the flesh is more than adequate, and there is no fire code or usher who can stop them. Of course, what’s a basketball game when a layup line doubles as a dunk contest? Who needs attention spans, anyway? There’s no shortage of humor as Williamson and his teammates engage in an overcomplicated warmup drill involving bounce passes, pirouettes, and decidedly, no dunks. For a moment, there is doubt. There are boos as he launches…jumpers. Then there are soft shrieks as he rises. Gently with two hands. Left hand, vicious off two feet. Alley-oops to self. A windmill. “Testing to see where [my] legs are,” as he’ll later put it. And to an outsider parachuting in for a first-time Williamson viewing, the disconnect wedged by the internet when it comes to player perception is painfully clear. He’s a truly astounding athlete—no player with his heft should be able to elevate like that, and no teenager should be that powerful attacking the basket and manipulating the air beneath him. He is a terrific passer and gets little credit for being unselfish, spending lots of time with the ball in his hands but rarely taking a poor shot. Of course, the last part is a little easier at a level where one power dribble can equal a layup. His gifts are without a perfect comparison—some Frankenstein hybrid of Julius Randle, Anthony Bennett, Shabazz Muhammad and Miles Bridges comes to mind, representing Williamson’s skill level and bruising style, but failing to quantify the rarity of his athletic package. Put bleakly, he is a burly 6’6” combo forward who may lack an NBA position and who shot just 1 of 7 from three-point range last Saturday. Wherever he goes to college and whether or not Williamson succeeds as a professional, it’s clear there will be no case study quite like him. It’s certainly not worth being judgmental off one game. Williamson is a player we’ll all enjoy as long as he’s running the floor and taking flight. There are NBA dunk contests and guaranteed dollars in his future. But it does seem fair to posit that no matter what, he’ll have a difficult time ever scratching at the level of hype foisted upon him by the social media complex. The celebrity-centric high school hoops culture works quickly, and sometimes dangerously. Anyway, Williamson announces his college commitment on Saturday, and Kansas, Kentucky, Duke, North Carolina, South Carolina and Clemson are the final six. For a deeper dive, read Chris Johnson’s deep-dive feature. You may remember that back in November, ESPN broke the news that the NBA and Players Association met with the NCAA and discussed, among other things, potential changes to the one-and-done rule. Internally, the league had been having conversations for some time. In wake of the FBI’s findings with regard to corruption in college basketball (which many in the industry believe to be just the tip of the iceberg), it seemed a real discussion had begun as to how the league might adjust its policy. Keep in mind that this is a decision between the league and the union (which has long hoped for players to enter out of high school), and the NCAA has no direct say in the matter. Fast-forward a couple of months, and the discourse has slowed somewhat. The feeling from front-office types and others around the league is that change is inevitable, and that a solution based around the concept of ‘two-or-none’ is where things are headed. But NBA teams pushed back when it came to a timetable, and justifiably so: it certainly would have been unfair to ask teams to expand their scouting departments and gather information on a wealth of prospects they couldn’t have seen much previously per league rules. You won’t find any scouts champing at the bit to scour high school gymnasiums around the country in addition to their other responsibilities. An educated guess suggests new rules coming into effect for the 2020 draft at earliest, which would allow teams more substantive notice and time to plan and scout accordingly. Whenever one-and-done changes, there will be ripple effects across all levels of basketball, but rest assured it won’t affect this year’s draft. This weekend marked the third straight year I've attended the HoopHall Classic in Springfield, Mass., one of high school basketball’s most prestigious in-season events and an annual opportunity for elite players to make impressions on the national stage. While there were some missing persons this year as prospects Simi Shittu, Cole Anthony and Chol Marial sat out with injury, there was a serious swath of talent on display. We’ll have more on draft-eligible guard Anfernee Simons on Wednesday. For now, get to know some of the other prospects who stood out. Reddish's massive upside was on full-display at HoopHall. We regard him pretty clearly as the top prospect in the 2018 class. It wasn’t Reddish’s best game, as he scored 25 points but shot just 3 of 12 from three, adding five rebounds and four assists but turning it over five times. There’s still plenty to get excited about. Reddish was less effective away from the ball, which will be relevant when he arrives on next year’s star-laden Duke team. But it may matter less from an NBA perspective, where Reddish should arrive as a clear candidate to function as an oversized lead ball-handler. The game has skewed in favor of non-traditional point guards in recent years, enabled by wide-open offensive philosophies and the success of smaller, wing-heavy lineups. With his crafty handle and ability to draw defenses and make the correct pass, it’s easy to see Reddish, even as an incomplete product, and envision that sort of future. Reddish spent a decent share of his possessions using high ball screens and made a few impressive passes in those situations. He appeared comfortable using both hands and going either direction, and utilizes a variety of head and shoulder fakes that at 6’8” make him a difficult cover. There’s a natural rhythm to his handle, and he’s able to change directions creatively His defensive effort wasn’t great, but he’s rangy and instinctive when locked in. The hardest thing to peg was Reddish’s jumper, which at times he shot haphazardly. He doesn’t elevate as much as you’d expect, which may or may not matter, but coupled with a low-ish release, it’s worth noting. Either way, it’s nitpicky: with a good year at Duke, Reddish will be in position to go high in next year’s draft. It’s no secret at this point that Barrett is far and away the most polished prospect in high school basketball. His Montverde team was the only program with two games over the weekend and Barrett showcased his considerable talent in both, totaling 43 points, 13 rebounds and five assists and shooting 45% from the field. He’s an impressive leaper who gets off the floor with ease, can finish with either hand and looks comfortable scoring at all three levels. Barrett’s wiry strength and agile feet project well defensively on the wing. As his competition improves, Barrett’s star potential will be tied to his perimeter shooting and ability to score in isolation situations long-term. He did have some turnover struggles against a physical Chicago Simeon team, and continuing to tighten his handle will be a key as he transitions to the college level. As a baseline, he should have a long NBA career as a versatile wing player. 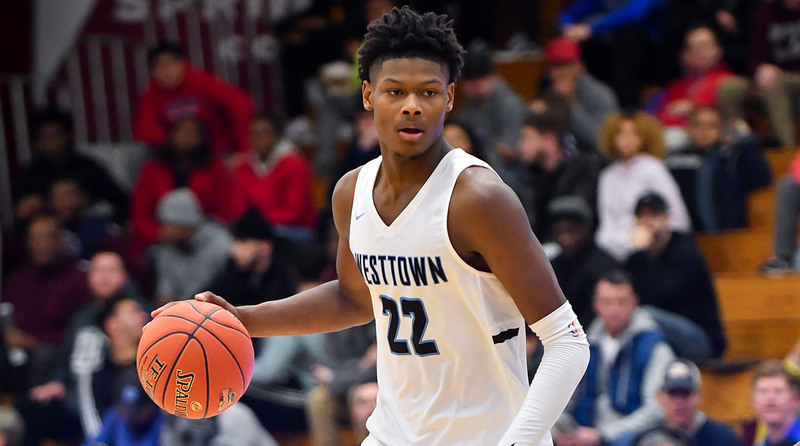 His game has come along nicely over the last couple years, and after reclassifying last summer he’ll join Reddish and give Duke an elite pair of prospects. Expect him to be squarely in the 2019 lottery mix. The most absurd sight of the weekend was watching Bol do his thing, dropping 31 points, shooting 14 of 18 from the field and pulling off several physical feats that most people in the gym had never seen before. He’s gifted with obscene height and length and a good deal of coordination, capable of catching lobs far from the basket and taking off from beyond the paint for dunks. There’s not much precedent for a prospect of his ilk, and his showing won the crowd over and led Findlay Prep to a 44-point win against an overmatched Immaculate Conception team from New Jersey. Alas, there’s a catch. Bol mustered just two rebounds in the game, which for a player with his physical gifts is almost impossible as some of the highlights he pulled off. He’s built a reputation over the years for simply not caring at times, and while he was engaged on offense for most of the game, Bol displayed little commitment to other areas, all of which will matter at the next level. While he occupies a lot of space vertically he doesn’t cover a lot of ground, and while that’s partially tied to his effort, it’s difficult to envision how Bol might slot into the wide-open NBA. On talent alone, he’s easy to place among the top prospects in the 2019 draft discussion, but how he responds to coaching and performs at Oregon will be the ultimate tell. At this stage, there’s reason to be skeptical. Lewis had one of his best showings to date on Sunday, scoring 27 points on 9-of-15 shooting, draining four threes and showcasing a well-rounded skill package. He has a high athletic ceiling and played with confidence and intensity from start to finish, despite his team losing in a blowout. When we scouted Lewis last spring, he looked tentative and was coming off a minor Achilles injury. This performance essentially cleaned his slate. Lewis’ explosiveness, speed and quick feet jump off the page both as a scorer and defender, and it’s evident he’s worked on his ball-handling and jumper. Consistency will be critical for Lewis, who has had some ups and downs over the past month leading into the HoopHall. But he appears to love competing and should have a lot to offer at the next level, particularly given he’s only a junior. Duke, Florida, Kansas and Kentucky are among his suitors. King’s game has come a long way since this time last year, and he’ll give Oregon a pair of intriguing talents to play with next season. He turned in a 32-point, seven-rebound, four-assist, three-steal performance in a win over the John Carroll School on Monday, flashing a great degree of versatility that bodes well in the long term. King has grown four inches in two years, his long frame (7’0” wingspan) will certainly translate as he adds muscle, and he displayed finishing ability with both hands and good body control attacking the basket. He can be overly flashy at times and had six turnovers, but will make the right pass and displayed more positive than negative. He also made four threes. There’s a lot of development left for him, but he’s not lacking for talent and could be a one-and-done candidate if he’s able to play consistently, tighten his handle and figure things out quickly at Oregon. A late riser up the high school rankings, Horton-Tucker made the most of a head-to-head matchup with R.J. Barrett on Saturday, keeping up impressively at times with one of the top dogs in his class. A tough, wide-set wing, Horton-Tucker displayed high-level shot-making ability both set and off the dribble and a solid handle that offers some potential to play shooting guard long-term. He can be a true multi-positional defender down the line as he refines his body. Horton-Tucker had some frustrating turnovers and his shot selection must improve going forward, but there’s a lot of untapped talent here. Maryland commit Jalen Smith displayed impressive competitive fire and some stretch-big potential in a 23-point, nine-rebound and three-block showing…Bryan Antoine slid over to point guard due to a teammate’s injury and took a backseat to Scottie Lewis, but remains an NBA prospect to track…Courtney Ramey has the physical tools to be impactful at the next level and is a top uncommitted senior to follow…LSU-bound center Nazreon Reid remains uniquely talented, but will have something to prove in college when it comes to playing hard…With LaMelo Ball off to Lithuania, Onyeka Okongwu has taken center stage for Chino Hills, flashing rim-running ability and shot-blocking potential…After literally every college coach had left the gym, Springfield Central’s unheralded 6'9" junior Hason Ward balled out for 19 points and seven rebounds in a win.